A watercolor painting either painted by (or commissioned by) Major David Bates Douglass (D.B.D.). This painting was sent to BHRA by a descendant of D.B.D. Although the painting is unsigned, it has written on the back "D.B.D proposal for a subway in NY". We believe that this was D.B.D. 's vision for Atlantic Avenue. 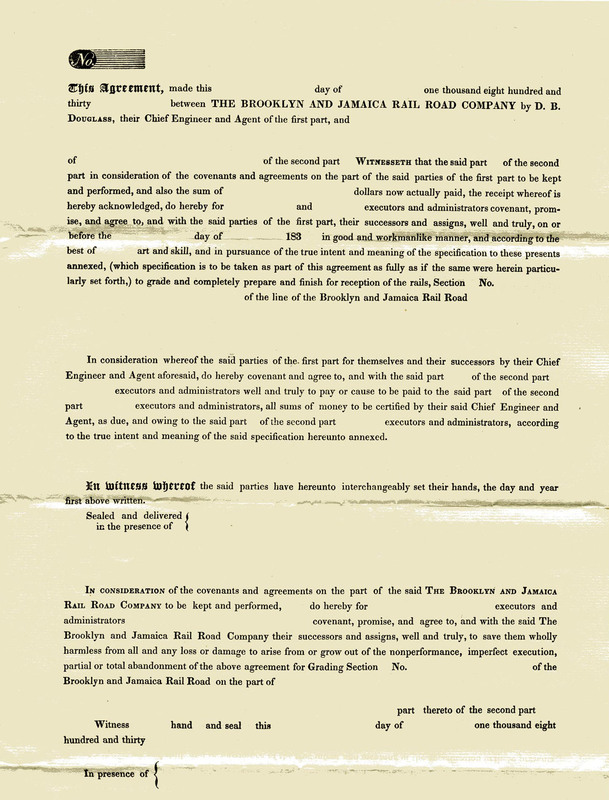 Major David Bates Douglass was the designer of the LIRR's routes to Boston, and the railroad's original Chief Engineer. Among his other accomplishments were the design of NYC's first Croton Aqueduct, as well as Brooklyn's Greenwood Cemetery. 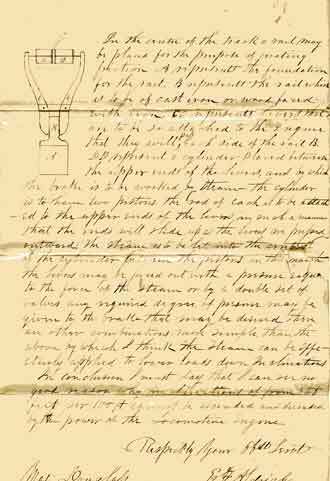 Douglass may have also created the final design for the Atlantic Avenue Tunnel. More info on D.B.D. can be found on our main Atlantic Avenue Tunnel page in this section. The locomotive represented is very specifically of the era and configuration of the earliest LIRR locomotives. Note the resemblance to the one illustrated in the 1845 drawing of the entrance to the Atlantic Ave. Tunnel. While D.B.D. had tunnel designing experience from the Croton Aqueduct project, this image shows a much more sophisticated planning process that was not dependent on tunnel engineering. It is our opinion that the D.B.D. 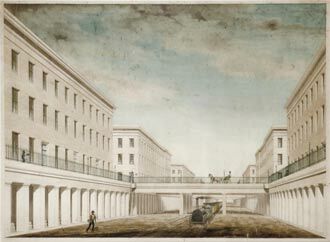 painting above was his design for an alternative to the Atlantic Avenue tunnel, which had been cited by contemporary newspaper sources as being a plan for an "open cut design". the building design aspect of the drawing was D.B.D. 's vision for a fully developed Atlantic Avenue. Major David Bates Douglass (D.B.D.) was living in Brooklyn at the time of the Atlantic Avenue Tunnel's construction. D.B.D. was creating pen and wash transportation and urban design related drawings here in the NYC area, circa 1832 (see this link for more info). 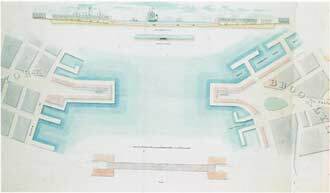 In addition to his other accomplishments, D.B.D also proposed the first tunnel under the East River to connect Brooklyn with Manhattan - this particular ink and wash drawing resides at the Brooklyn Historical Society. Another historically significant aspect of this painting is the high density uniform building design, with transit level accessibility and pedestrian level accessibility to every building along the street. Note the uncanny resemblance between D.B.D. 's circa 1832 vision of Atlantic Avenue, and the adjacent screen freeze from the seminal science fiction/futurist movie Metropolis, produced in Germany circa 1927. The early 20th century "Modernist" German design movement usually takes credit for the design concepts of our modern cities. However, apparently D.B.D. had the same futuristic urban vision a century before, back in 1832. Note that in the film still from Metropolis, the intra- city railway also operates in an open cut in the center of a very wide street, and also the streets are lined by uniform monolithic buildings of nearly identical style. B.D.B. 's circa 1832 design for Brooklyn's Atlantic Avenue is displayed adjacent to this image for side by side comparison. Although two images embody similar design concepts, D.B.D vision is of a future people would want to live in (utopian vision). Envisioning Brooklyn as a pristine alabaster city; a place where new industrial technology peacefully mesh with urban form and established social tradition. 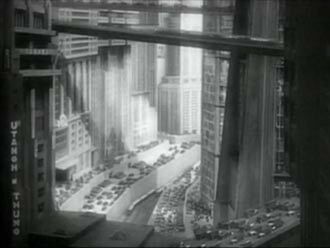 In contrast, the futuristic city presented in Metropolis was a warning of the negative dehumanizing effects of industrialization. 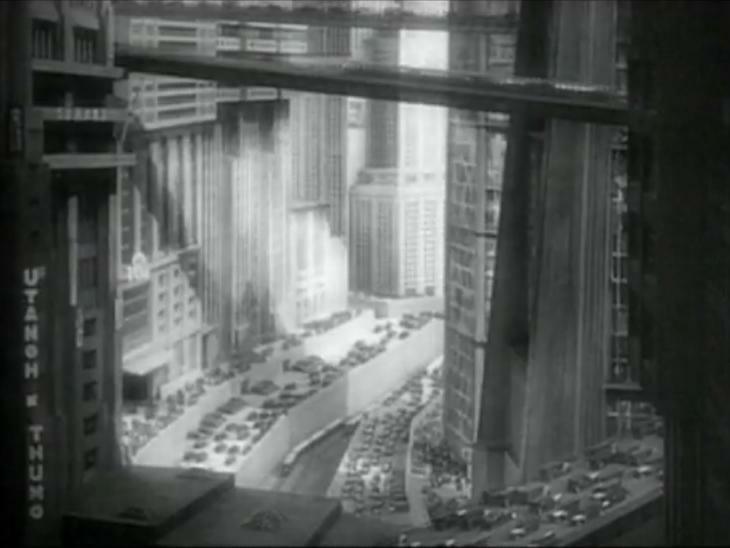 Metropolis presents a dystopian future, as can be seen in this film still, a future of people stuck in traffic beneath the shadows of giant buildings. 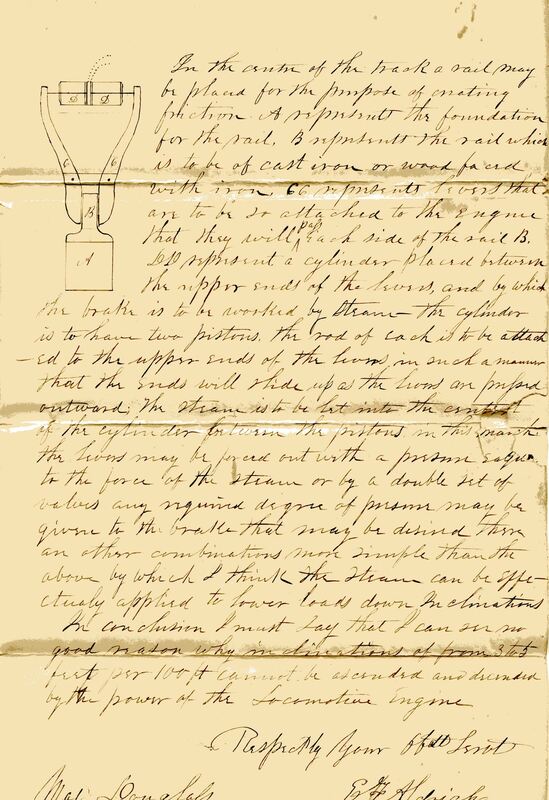 Also, Below are two transcriptions of papers from the Douglass Special Collection at Kenyon College. 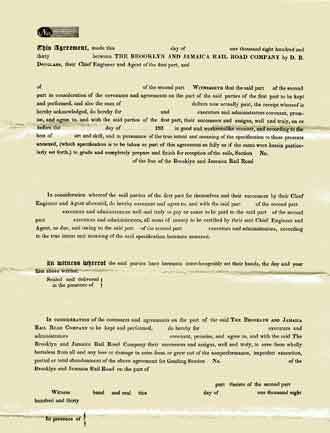 These two c.1832 contract forms, were used for the construction of the Brooklyn and Jamaica Railroad- the part of the LIRR's original line to Brooklyn's former South Ferry- Atlantic Avenue & Columbia Street. Part of this same route, is still operated by the LIRR. 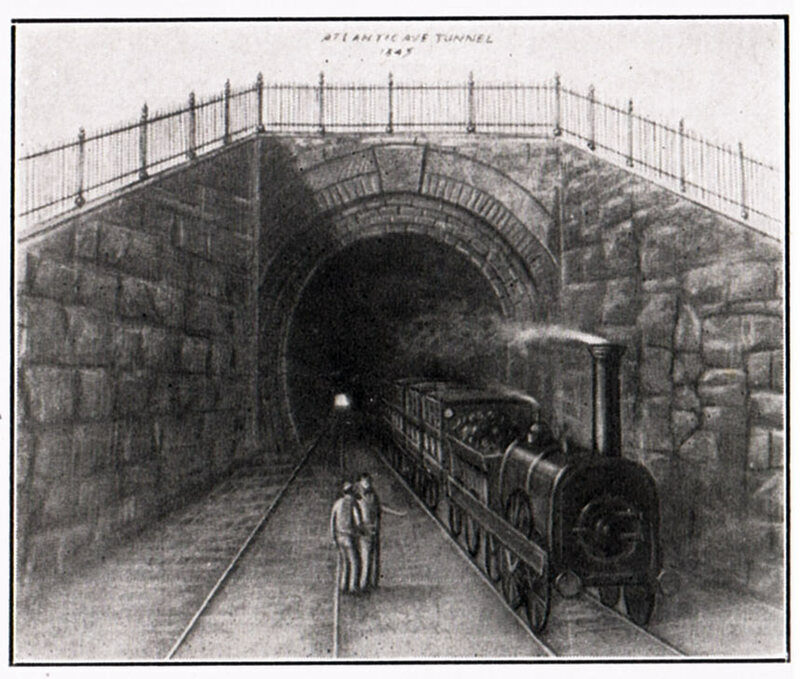 The very first tunnel proposal, to connect Brooklyn with New York City, ca 1833! Note the sub-aqueous part of the tunnel, would have been made of roughly 10 foot diameter cast iron tubes, sunken in place- the same method later used in 20th century NYC transportation underwater tunnels. Note also, that the East River by 1833, had already been land-filled to about half of its original width.